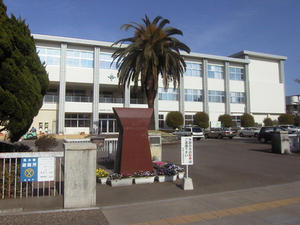 Miyazaki Omiya High School is located in the center of Miyazaki City in Miyazaki Prefecture, on the island of Kyushu in southwestern Japan. Miyazaki Prefecture is famous for its warm, sunny climate and the friendly disposition of its people. Miyazaki City is the largest city of more than 400,000 people in Miyazaki Prefecture, situated in the southern part of the Miyazaki Plain, facing the Pacific Ocean. Miyazaki is also famous for being the birthplace of the first Japanese Emperor in ancient Japanese Mythology. Around our school, there are four significant institutions: Miyazaki Museum, Miyazaki Prefectural Art Gallery, Miyazaki Prefectural Library, and Miyazaki Shrine. In 2015, the school turned 127 years old, and has the longest history and traditions in the prefecture. Founded at the turn of the century, our school has endured, prospered, and grown throughout the years. With over 48,000 graduates working across various fields, it inherits tradition and continuously aims for improvement. Our school has a long tradition of excellence in education. The key to Omiya's educational philosophy is a relationship based on trust between teachers and students. A harmonious and cooperative relationship among teachers is also emphasized in our school. The students of our school are taught to pursue truth and beauty, to tread the path of virtue, and to enhance self-independence and autonomy. Our school strives to guide its students to become open-minded individuals capable of leading Japan into the future. It is this connection between teachers and students that is the pride of Omiya High School. Copyright© 2015 Miyazaki Omiya High School. All Rights Reserved.